The Lord's Day in Christianity is generally Sunday, the principal day of communal worship. It is observed by most Christians as the weekly memorial of the resurrection of Jesus Christ, who is said in the canonical Gospels to have been witnessed alive from the dead early on the first day of the week. The phrase appears in Rev. 1:10.According to some sources, Christians held corporate worship on Sunday in the 1st century. The earliest Biblical example of Christians meeting together on a Sunday for the purpose of ""breaking bread"" and preaching is cited in the New Testament book The Acts of the Apostles chapter 20 and verse 7 (Acts 20:7). 2nd-century writers such as Justin Martyr attest to the widespread practice of Sunday worship (First Apology, chapter 67), and by 361 AD it had become a mandated weekly occurrence. During the Middle Ages, Sunday worship became associated with Sabbatarian (rest) practices. Some Protestants today (particularly those theologically descended from the Puritans) regard Sunday as Christian Sabbath, a practice known as first-day Sabbatarianism. 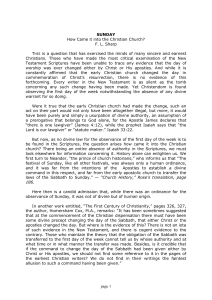 (Some Christian groups hold that the term ""Lord's Day"" can only properly refer to seventh-day Sabbath or Saturday. )Sunday was also known in patristic writings as the eighth day.